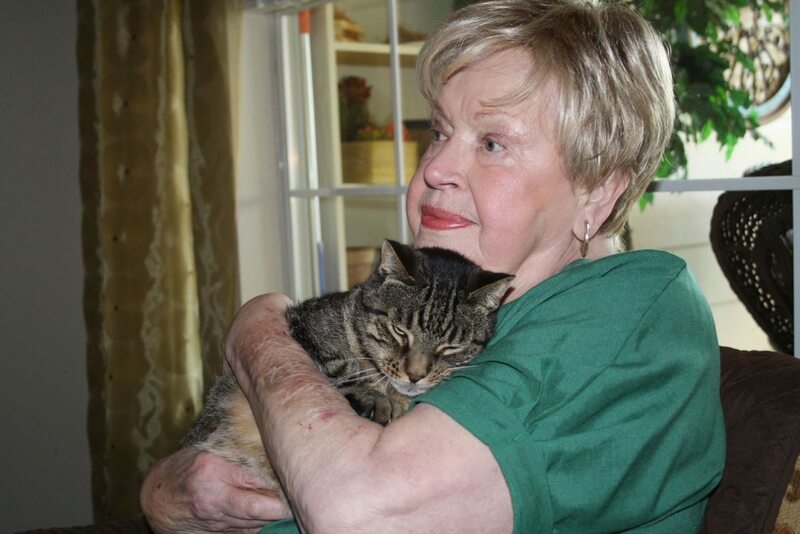 One day, a woman named Fran Swayze decided to adopt a cat from a local no-kill shelter. When she got to the shelter, she fell in love with a gray and black cat named Bandit. 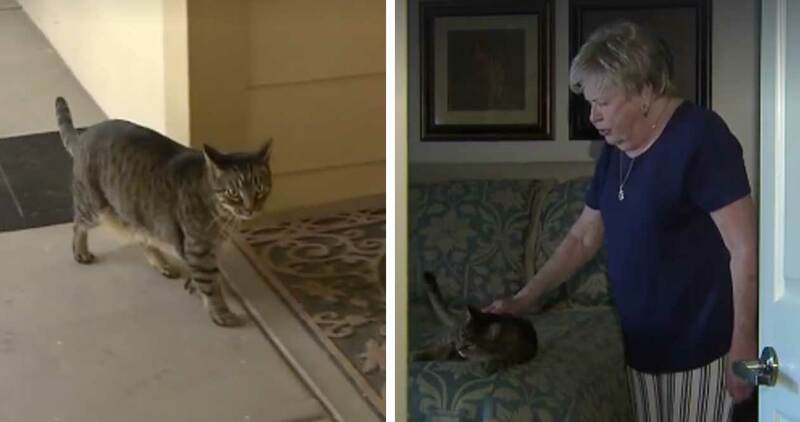 She took Bandit back to her apartment at a senior community complex, and he instantly made himself at home. Bandit was a smart cat and a great companion for Swayze, and she was happy to have him in her home. 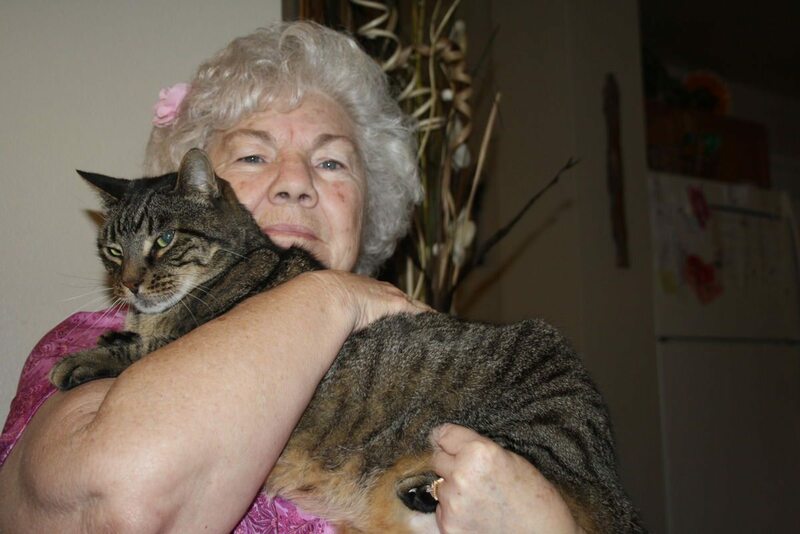 Swayze could have never guessed that her new cat would save someone’s life! Bandit is an energetic cat who loves taking walks around the senior community complex. Swayze and Bandit typically go on one long walk a day. One night, Swayze was talking with her daughter Marilyn Gravelle, who had come to visit. As they sat in her apartment, Bandit stood at the door and meowed, looking like he wanted to go outside. Bandit walked to the end of the second floor of the building and stuck his head under the railing. Swayze and Gravelle looked over too. That’s when they saw a woman named Mary Baker lying on the ground. Mary had been walking her dachshund, Sugar, when her blood sugar dipped dangerously low. She passed out, and when she came to she couldn’t move. “When they got to me I was just barely talking and going ‘help me, help me,’” Baker told CBS DFW. Swayze called an ambulance, but Baker decided that she didn’t want to go to the hospital. So Swayze and Gravelle sat with Baker while she drank some orange juice and recovered from her fall. Bandit saved Baker’s life, and he also brought Swayze and Baker closer together. The women didn’t know each other before Swayze rescued Baker, but now, the two are good friends. Baker even calls Swayze her sister. CBS DFW shared Bandit’s story on Facebook, and it received hundreds of likes and shares. Everyone was amazed by the cat’s valiant actions. WATCH: A Cleburne cat is credited for heroics! Bandit is a truly heroic animal. We’re thrilled that this courageous cat has found such a great home!